Some of you right now are barely making it through this year, and are so dreading the return to school the following morning that you can’t even enjoy your evenings. The idea of going back to That Place just makes you sick to your stomach. You want to quit more than anything but have no idea what the alternative would be. I get it. I have been in your shoes. Others of you still love teaching, but you’re feeling an itch to do something different. You want to make a greater impact for kids, or you want a more flexible schedule, or just feel like there’s something more out there for you. I’ve been in that position, too. You see, I’ve quit teaching twice: once because the school environment was so toxic that I hated my job, and once because I wanted to shift into a different role in education. I’ll share both of those stories today with you and share five things I learned that might be helpful to you, if you’re thinking about quitting for either reason. It was just over 10 years ago that I quit my teaching job mid-year, during my sixth year of teaching, and it was one of the hardest decisions I ever made. My administrators were blindsided by the decision–after all, I was an experienced teacher with multiple years in urban schools, and I had a good handle on my classroom. My students were learning, and their benchmark test scores showed strong gains. The kids liked me, their parents liked me. Things seemed to be fine. But what people didn’t know was that it took EVERYTHING out of me to keep it that way. I had just moved to the state and had no idea what to expect in my new school. I was disappointed to learn that most of my second graders were reading on a late kindergarten level, and the pressure to get them up to speed was weighing heavily on me. We had no windows in our classroom and were not allowed to have recess or any break at all during the day (per district mandate), so I was stuck in a tiny, dark classroom with a large class of energetic seven-year-olds and zero outlet for all their energy. Beyond our four walls, the school’s atmosphere was in total chaos. We couldn’t send students to the bathroom alone, as there had been instances of both girls and boys being raped there by other students. One of my kids found a knife on the ground on our way to lunch. An off-duty police officer and a drill sergeant were hired to help control the students in the cafeteria: one of them would bend over and scream in the children’s faces while the other marched up and down the center aisle, yelling into a microphone as the kids threw food around his head. Not exactly a fun working and learning environment. Things were quite a bit calmer in my classroom, but student behavior still posed a huge problem. Getting students to respond appropriately to even the smallest request took Herculean, first-day-of-school efforts from me. It was like the movie Groundhog Day. We practiced the same basic routines and procedures over and over, and three-quarters of the class just wasn’t internalizing anything. I was managing the classroom, I was maintaining some sense of order, but I wasn’t teaching. I wanted to have deep conversations with my students about current events. I wanted to delve into books with them and watch their eyes light up when they made connections between the text and their own lives. I wanted to see them develop a sense of curiosity and wonder about the world through investigations in science. But by the second quarter of the school year, the kids still weren’t anywhere near ready for those things. And so I was still spending the entire day disciplining students and teaching them basic work habits and socio-emotional skills, alone and without support in a chaotic, unsafe school where neither their needs nor mine were being met. I hit a breaking point where I realized my job was not worth the energy expenditure I had to put out every day. I realized that I was up against too many obstacles, and most of them were insurmountable. Things were not going to improve significantly and I was going to go home exhausted every day because the school culture was so toxic. And yet the guilt I felt over even thinking about quitting was indescribable. Was I really willing to abandon such a needy group of children in the middle of the year? What kind of person would give up on those kids and look for an easier job just so her own life could be more comfortable? I felt selfish. I felt like a hypocrite. I felt like a failure as a teacher. My principal was absolutely furious at me for putting her in such a difficult situation. But even worse was the unexpected reaction of my students. I thought they’d be devastated, but most of the kids barely blinked when I told them Friday would be my last day. Part of their nonchalance was because of their young age, but I realized with a sinking feeling in the pit of my stomach that they were so used to losing teachers and other important adults in their lives on just a moment’s notice that this was par for the course. I got hugs and letters and a few tears on the last day, but the majority of the class was so wrapped up in their own issues that they weren’t even thinking about me. Five minutes before the final bell rang, two of my toughest kids got into a physical altercation over an eraser one of them had thrown, and I was so busy dealing with them and school security that there was no opportunity to have wistful goodbyes. My time at that school ended just as chaotically as it had started. My decision to quit in the middle of the year would have been much tougher if I’d decided to leave the field altogether. I knew that I wasn’t done with teaching, and within a day of making my decision, I had an interview in a neighboring county and was hired on the spot. I realize that’s not the norm. But maybe you can relate to this part: the hope that in a different school, the love of teaching would return. I can tell you without a doubt that it did. My new school had its problems, of course, but I felt safe there. My students were safe. And I was able to really teach, again. I stayed in the classroom for another five years and even moved back to another urban high poverty school for the last two years of my time as a teacher. Urban teaching is where my heart has always been and will always be. If you have the right leadership and school culture, as I did in those final two years in the classroom, the quality of teaching and learning can be exceptional and they can be fantastic places to work. It was right when I had moved to that last school that I published my first book for teachers, The Cornerstone: Classroom Management That Makes Teaching More Effective, Efficient, and Enjoyable. I had been sharing ideas on my website for years and my readers encouraged me to compile everything together and write a book. So, I did, and then I started getting professional development requests on the book. I remember the first PD I did for a charter school locally in Fort Lauderdale. I spent the morning doing a workshop and the afternoon meeting with individual teachers in their classrooms, coaching them and helping them apply what I’d shared in the PD to their unique teaching situations. One new teacher I sat with just poured her heart out to me, and actually cried, because she was so grateful to have someone who cared and understood her situation. And that was the day I was absolutely hooked on coaching and mentoring teachers. I knew in my heart that for at least a time, I wanted to focus on teaching teachers instead of kids. It was a brand new challenge that excited me in a way that teaching children hadn’t done for a while, to be perfectly honest, and it was rewarding in a completely different way. I had been impacting 25 kids a year in my classroom, but just with this one PD day, I was impacting an entire school full of kids AND changing how their teachers taught every class in the future. I knew — both from the reaction of the teachers I’d taught and also from the uninspiring PD experiences I’d had myself — that the need for instructional coaches who really know and understand teachers is incredibly great. Teachers need someone in their corner, and I wanted to do that beyond just through my website. I wanted to make supporting teachers my #1 job. I stayed in the classroom one more year while I planned my next steps and also got married to my husband who was living and working in New York. I moved from Florida to New York to be with him and took on a part-time instructional coach role in the city. I was blessed with the opportunity to not only create change in education on a larger scale but to encourage and inspire my fellow teachers who were so very tired and discouraged. And make more money. And have a more flexible schedule. So as bittersweet and scary as it was to leave the classroom, I truly have never looked back. As much as I miss the kids, I know there is absolutely no way I could be doing what I’m doing right now with coaching teachers in The 40-Hour Teacher Workweek Club and supporting teachers through my blog, podcast, books, PD, and school-based work and speaking if I were still in the classroom. Some people manage to do it all, but there’s no way that I personally could have done everything well — my family life and health would have suffered, and my students would have suffered because they wouldn’t have been my #1 work priority anymore. I knew it was the right time for me to move on to a role as an instructional coach and educational consultant, and once again, I have peace about my decisions to quit my teaching job. No time to read the post now? Listen to it later instead! 1) Sometimes, the school year does not get easier with time, and that’s not necessarily your fault. Usually, I’ve found that teaching becomes less stressful as the year progresses because students get the routines and make more and more academic progress. Occasionally though, this was not true for me and it’s not true for other teachers I know. Sometimes the class is just a really difficult one and your stress level won’t improve until the following year when you have a different group. Sometimes the school environment is toxic and you don’t have the support you need. If you’re feeling like quitting because every single day with your students is a struggle, and you have not experienced that in past years, please know that just about every teacher eventually has That Class or teaches in That School, and don’t blame yourself for how difficult the job has been. Some years and some classes are just more challenging than others. 2) It’s not your imagination — teaching IS getting harder. Our students are coming to school with more and more problems, and the bar for achievement is continually being raised. More things are added to teachers’ plates every year and rarely is anything removed. The job will take more out of you, and there’s an even greater need for support roles in education: non-classroom-based jobs that help meet the growing demands that are being placed on teachers and kids. 3) You are not a bad teacher just because your job feels too hard. Even the best teachers get put in situations that are physically and mentally exhausting. Feeling like you want to quit does not mean that you were not cut out for the job or are a bad person. The position you’re in just may not be the best one for you, or you may just be having an exceptionally tough year. 4) Quitting does not equal failure. When I quit my teaching job mid-year at that toxic work environment, I struggled with the decision to quit long after I’d left the job, because I felt like I had abandoned the kids who needed me the most. I had to remind myself over and over: It’s not that I couldn’t do the job, it’s that I chose not to for my own mental well-being and physical health. I was not a failure, I was successful in taking care of myself. I have many other responsibilities in life in addition to being a teacher, and I was not willing to let all those other areas fall apart because of my job. 5) There are lots of ways to use your talents and gifts to help children. Many teachers who quit still have a deep desire to work with children and make a difference in their lives. There are many, many ways to do that. Your career as an educator does not have to be over simply because you don’t want to stay where you’re at. When I left the classroom in 2009, I knew I had the chance to make a difference on a larger scale. It’s hard to see that sometimes as a teacher because there are not many promotion opportunities within the average school. But if you think outside the box, there are ways to stay in education without being in the classroom. I’m not telling you to quit your job. Quitting is not always the right decision: in fact, there were plenty of other low points in my teaching career in which I wanted to walk away but didn’t. During those times, I found that I was frustrated in the moment, but I knew in my heart that things WOULD get better, that an overbearing principal would transfer to another school (he did), that the transition to a new curriculum would be for the best (it was), or that I could make it through just a few more months with an exasperating parent or student (I did.) One of the best things about teaching is that every fall is a new start. Sometimes the best thing to do is hold on until then. But for those of you who have emailed asking me whether to quit your job or teach on (and there have been hundreds of those emails over the years), I continue to say: do what you know is best for yourself. If you’re not sure, keep teaching and form a good game plan. Hang in there as long as you can. Read Awakened: Change Your Mindset to Transform Your Teaching and learn how to perceive teaching as a less stressful job. Join The 40 Hour Teacher Workweek Club and get productivity hacks to help you achieve work/life balance so teaching isn’t such an all-consuming job. If and when you hit that breaking point — your gut feeling is to go, and the reasons to leave truly outweigh the reasons to stay — you’ll know, and you should trust that knowing within yourself. You will hear many voices within the school system telling you to prioritize your work (or more accurately, your students’ test scores) but it will be far less often that you hear the message to prioritize your health and well-being, your lifestyle and family goals, and your professional aspirations, either within education or outside of it. I’m telling you that today: you have an obligation to your students, sure, but you have an even bigger obligation to yourself to create a life that you want to live. Living your best life might mean finding another job, or it might mean staying and developing different coping strategies for stress, but my advice is to do whatever it takes to pursue your dreams and aspirations, both professionally and personally. You deserve that. There is no shame in quitting. Choosing to say no to one thing will leave space in your life to say yes to something else. Showing up is the first and most important step: show and be there, present with the kids, ready to give all you’ve got. Thank you for this blog. Many teachers stay because they feel inept or unqualified to pursue other ventures, within or outside the field of education. You are very inspirational thank you for sharing your story and your success. Angela, how is it that you did not get in any trouble for breaking your teaching contract and leaving part-way through the year? I would love to resign, but would be afraid that my teaching license would/could be revoked for breaking contract! My state did not revoke teaching licenses for breaking contract. I know that’s not the case everywhere. Thank you for your honesty and very real blog posts and podcasts. I think that your feelings resonate with so many people who are glad they are not alone. I left the classroom when a library teacher position opened up. It has been life-changing and I am so happy with my decision. I have felt like a quitter, though. 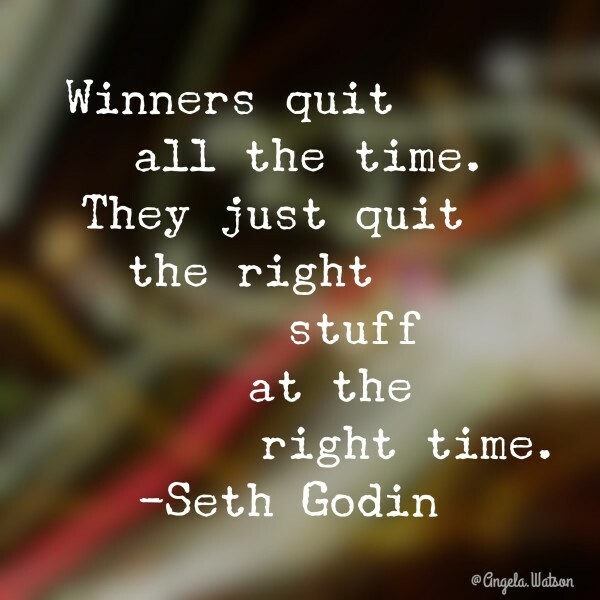 I love your quote about quitting at the right stuff at the right time. I will reread that when I feel guilty about my decision. I know it’s the right thing to do, as I am happier, have different stress, and most importantly, have more time for my kids and husband. I’m so glad you’re happier in your new teaching position. You are living proof that it IS impossible to do great things for kids without sacrificing your health and personal life. Thanks for this insightful post! I didn’t know you were from Fort Lauderdale! Yep! I started in Miami-Dade and then transferred to Broward. 🙂 Love South Florida! Angela, thank you for being transparent and vulnerable. I can totally understand your struggles to quit and even the feelings afterwards- especially about leaving the kiddos who needed you most. I appreciate you using your platform to help other teachers make sense of the mess they find themselves in… district mandates, test score pressure, paperwork galore, etc. This post reminds us to truly reflect and make decisions that are best for ourselves, and that being selfish for your own physical and mental health is okay. Thank you again for all that you do! I appreciate your kind words so much, Gretchen! I got so fed up that I also quit. However, I love teaching and thought I would get a job in another school system. It’s just not happening. I have been blackballed! I don’t know how to make a comeback. Do you have any suggestions? I made the hardest decision this year; I decided for my mental and physical health as well as my own personal happiness that I needed to leave the teaching profession. It’s scary, but I know that I’m quitting for the right reasons. I too am leaving the profession. 12 years. Testing, no cirriculum, lack of classroom assistance, disrespectful students that take up so much energy, no windows, unsupported admin, coaches no help, hard on family and marriage. I love the kids, but I’m tired. I truly believe team teaching needs a resurgence. I’m so sorry to hear you’ve both needed to leave a profession you love. I commend you for taking care of yourselves. I agree with the point about team teaching–if done well, it’s so much more effective and sustainable long term. The workload now is just too much for any one person to bear in many cases. Thank you so much for this post! I have been very discouraged lately, and your insights were very helpful. Thank you for sharing. What an excellent post! You clearly explained two different experiences when you have left the classroom and I love the “5 Things I Know for Sure”. They’re all so true! The struggle to teach well in recent years is real. It’s more and more difficult to feel like I do a “good” job teaching. I love how this post resonates on so many levels. I, too, have left the classroom twice, for two different reasons, not unlike yours. They have both opened other doors for me and opened my eyes to new possibilities. It was definitely a leap of faith both times. Thanks for chiming in with your experiences–and sharing that it was a leap of faith for you both times and that it worked out well. I know that gives other teachers a lot of hope. Thank you Angela ,you give all of us educators hope and courage. Thank you for this post, and the honesty you shared while writing it. I was sitting on my couch, crying and dreading going to work in the morning, when I came across your blog. It was exactly what I needed to read. I have been sick to my stomach all day at the thought of going back in tomorrow, and it was nice to know that it doesn’t make me a bad person to want to quit. I’m not going to be able to quit, but it was a good reminder that it does get better. This year will be over, and I can go on to another school where it (hopefully) won’t be as toxic (as you said). Wow, that timing was amazing! So glad you shared. I’m glad you feel less alone now, and more hopeful. It CAN and DOES get better. I felt terrible about breaking my commitment. But physically and mentally, I just couldn’t stay. Teaching is just one part of my life, and I couldn’t sacrifice everything else I cared about for my job. It was the right decision for me. As for the kids…ultimately, life goes on. The class I left mid-year graduated from high school this past spring–my absence didn’t stop them from accomplishing their goals. Some other second grade teacher came along and filled my shoes. I was just one teacher out of dozens they had during their time in the K-12 system. I’m not carrying the weight of abandoning them or feeling like their success was wholly dependent on me. It was honor to play a small part in their lives for a short time, but that wasn’t the be-all and end-all for either of us. Aaron is correct, it is NOT his place to judge you. I don’t know how you could’ve made it any clearer, because it comes across VERY plainly and SINCERELY that this was a decision you made for the sake of your own health and for the sake of your relationships with your family, that the personal cost to you was beyond what you could pay (not to mention, WAY beyond what any of us should be asked to pay)! I applaud your decision, and wish I had done as you have. Sadly, I stayed the entire year, was assaulted 2 more times by students (making for a total of 5 – and this is Kindergarten),and wore myself out so completely that I have become seriously ill, and will not be able to return to full time work of any kind for at least the coming year. And, I also wonder if Aaron even read you entire post….? Thank you again – it was wonderful to find your blog! Angela, I chose early retirement after 25 years of being in education; most of those years were spent in the classroom (secondary English). My conditions were really very good; however, teaching 160 students a day and giving them feedback on their writing and research papers took its toll, as well as getting up at 4:30 each morning. I chose to retire early so that I’d end my career on a good note. If I’d stayed, I would have been less of a teacher, unable to give 100% anymore. That would have been unfair to my students. I really enjoyed my students, but I am not sure I would encourage young folks to go into teaching these days, and that’s sad! And this from a teacher who had a great district and mostly good students to work with! I think you’ve made some important points–there’s a lot to be said for leaving BEFORE you burn out. We all know teachers who should have quit YEARS ago and are doing a tremendous disservice to their students by staying at a job when their heart isn’t in it. I love your decision to go out on a high note. Thank you for explaining why you left teaching and most of all, for laying it out there openly and honestly that yes, we deserve to live a life that we want to live!! Teaching kids is awesome, but we are not slaves to the district, to the parents, or to the “system” as a whole. Teaching means we give our time and our expertise consistently during contract hours, but we are not obligated to give up weekends, evening hours, or personal family time “for the kids”. And shame on those who make us feel that way. At some point, we have our own families to take care of and we need to adhere to those things that make life worth living. Thank you for this post! Well said, Laura. Thanks for reaffirming the message this message. Laura, well said…well said…”shame on other’s who think we should lay down our life to please parent’s, the district, or the system. To not be obligated to our family or personal time. I enjoyed your words of truth! Wow! I think you are in my head! I am in my 6th year and feel like I am done….not done teaching….just done where I am. I really loved my school so much that I was a long-term sub there for 2 years before getting hired. Things have changed so dramatically that it is not the school I loved teaching at anymore. There are many days I am in tears and so stressed that I know it is not good. I almost feel myself checking out. I am looking at other opportunities because I love teaching, but I also find assisting other teachers, mostly with tech stuff, is where my heart is right now. Thanks for this blog – it really, truly has spoken to my heart and soul. Angela, you have expressed what I could not. I know in my heart what I need to do. I love #4 on your list. Thank you for stating it so eloquently. I am sharing this. Thank you for this wonderful article. I really identified with it. I also quit the classroom twice and now I am in an instructional specialist role. At the time I also felt guilty and scared, but I am so glad I made that leap of faith! So glad you found a position you’re happier with and are still able to make a difference for kids and teachers! Thanks for this post. This is my first year teaching, and it has been awful. My contract was not renewed since the school system didn’t believe that I improved fast enough, although I was basically on my own with difficult students and incomplete curricula. I’m looking to leave teaching for good but I’m not having any luck finding jobs that aren’t in teaching. I’ve gotten an offer from another school district and while my family is happy for me I’m miserable. I’m trying to escape but there’s no way out of this. Jessie, your district should have assigned a mentor to you from day one. You should have had a solid support system to help you through your first year of teaching. Our state requires you have a mentor and all the help you need. Teaching is a rewarding profession but can be lonely and difficult on your own. My college professors used to say, “During your first year of teaching, decide you will teach a second year.” Their premise was that things would get better. That was definitely true for me! I wish you well, no matter the path you choose. Thank you for posting this! I wish I’d seen this last year when, after 12 years of teaching special education, I had the worst year of my career: A principal that constantly criticized and offered unrealistic advice, I was physically attacked several times by a student who was inappropriately placed and no discipline procedures were followed, I asked for support and was told to improve my management… I felt beaten down and exhausted daily. I didn’t quit until the end of the school year and felt like a complete failure. In addition, my former principal made it very difficult to find a new position. I’m now in a new position, in a new school, I have plenty of support, I feel confident again, and I love what I do. I feel energized when I go home and exhilarated when a lesson goes well (which is often). My administrators offer good advice and give me positive reviews. I’m a good teacher again. My only regret about last year is that I didn’t quit sooner. That year taught me a lot about setting limits and accepting when a situation is not salvageable. Rebecca, I could have written your post (with a few minor details changed) a year ago when I left my job as a SPED teacher. I actually landed a new position in my home county, but it was ripped out from under me by my former SPED director. I loved teaching and working with my students with special needs; however, I had to get out of that toxic environment. I am working on a dream I have had for a long time, only it’s taking a lot to get it going. I’m glad you found a place where you can truly teach. This is a very encouraging story for other teachers. Thank you so much for sharing it. I’m so glad you love your work in the classroom again! Good for you! 🙂 So glad you bounced back from that situation. I quit my teaching position in a toxic (team) environment after being yelled at by my headmaster everyday. It got to the point where I felt like I was a second grader who just had stolen another kid’s lunch as was eing punished for it every day… I then was offered to transfer to another school, where it only got worse… I was even attacked by an 8th grader and was verbally abused even more… after many hours of panic attacks even during the night, I decided to quit for the rest of the school year and start over in the fall. My family and I are moving to a very nice small town where I hope the schools, team s of staff etc. will be better. I applied for a teaching programe to get my national license (it’s different in Europe) and then hope to find a job at a Christian elementary school. Thank you so much for your kind words of encouragement, because I really feel like a failure, like I don’t even deserve to be called a teacher, because I wasn’t strong enough to take all the negativity, because I didn’t find a way to turn my bad situation magically around… because I really feel like something within my spirit broke and I questioned my passion for teaching over and over again, because of those feelings of failure. I hope and pray that I will be strong enough to start over in the fall, and that God might assign me to a nice and kind environment, where I can and will be able to teach with joy again. I’m so glad you found this post encouraging! Hang in there, my friend. The right teaching job is out there for you! I have had so school changes in the last 6 years it is very exhausting. I once was not chosen back to a position with pre kindergarteners, in our district it’s a full time position by a administrator who didn’t care for me. I did great work and I felt strongly about a situation that I was replaced. So I had to take a job fair position in first grade that was very difficult but I did do the best I could and now I was hired to go back to the prt kindergarten job at this school. So, stay encouraged and do the best you can do ask for help reach out with colleagues because it shows your trying and a hard worker. I wanted to leave a few reaching positions, I cried stayed up all night , I looked for other types of education jobs but none would offer the pay or the desired school schedule I was used too. I will one move on to another lower stress job eventually. So I say to all the teachers work on an endorsement or take a part time teaching job but don’t stay in a position you struggle without seeking help or calling your union. We matter we have a life and I decided I was going to live and not die teaching kids we need and deserve support! Thank you for sharing your perspective and experiences. I too struggle with the expectations with lesson planning in art. EVERYTHING must be included and updated daily– including individualized instruction and notes with each specific student. I work at three schools, so this is an incredible amount of writing. Even though I touch base with these things in my lesson, they are ignored if it is not written in the plans. Its incredibly stressful and I sometimes wake up at odd hours of the night in panic over these lesson plans! I have been contemplating leaving but I am not having the best of luck finding a new career without moving. I am an art educator living in a small community. — But thanks for the perspective. I am going to try to give it another 2 years for financial reasons. Hopefully it gets better. I also think of throwing in the towel and starting over somehow. Wow that principal sounds so typical! Where do they find these people?? Tears come to my eyes as I read this post. Your principal and their tactics mirror my former principal’s all the way from observing before a holiday to the higher learning questioning. Teaching can be soi subjective. Your principal’s goal was to run you away-quit. Your goal was to feel like your hard work matter and have a piece of mind. I fel you came out on top ! Love this article! I plan to read and listen to more of your ideas. Thanks for writing this. I just finished a really tough school year in Detroit and I’m making some decisions as to whether I want to continue teaching or pursue something else. Thank you for these words. I just finished my second year of teaching and cannot for the life of me determine why anyone does this job more than two years. School starts in three weeks and I can’t even think about going back. I didn’t reapply for my position in middle school science because the students were so apathetic and their parents equally belligerent. My admin didn’t seem to care much, and that is a real shame because I worked over 100 hours a week, to the detriment of my family and parenting. I’m sad but I feel like my unemployment check will help pay for the therapy it will take to get over these last two years. I have never been treated so poorly in my entire life. Thanks. After 18 years I don’t even have enough energy to TYPE a reply let alone verbalize one. Exhausted. And, humbly, I’m beloved by kids and families. But I just got nothing left. It’s taken everything to make it look that easy. On paper, 7 more years for the pension is a no brainer. In reality, it would steal whatever is left of my brain. Wow!! Your story is very similar to mine. I quit after 2 years for my peace and sanity due to a somewhat toxic environment. I went to grad school and finished. Now I’m at a new school, starting my 3rd year. It’s a wonderful environment to work in, but I’m in the situation where I’m ready to leave again. I want to impact children just not in the classroom. There are way too many demands and the curriculum is bogus. I want to move on and have a career in education (it’s my calling) with a flexible schedule, but I worry because I do not have many years in teaching. That’s where I am in life right now. Thank you for this post. I came out of corporate America 5 years ago thinking I would go into the “mission field” of teaching. Every year I’ve taught has gotten worse than the year before. I took a job at a school that had to hire all new teachers( I didn’t know that information at the time of hire) because the principal is so difficult to deal with. I’m 6 weeks in and terribly miserable. It’s bad enough that I’ll probably loose my license … But I don’t care. My question is, is it better to quit now before evaluations start or take the bad eval and hold out till Christmas? Any advice? Thank you for this article. It has given me a lot to think about. I am in need of some advice. I am miserable as a first year teacher. I am in a private school teaching math classes in a 6-12th grade school. I have 6 classes total from age ranges of 10 -18. I am dying. The school year has only gotten worse. The staff is unsupportive and gave a first year teacher ALL the classes with students at least 2 grades behind level. I’ve tried to talk with admin, and they made it clear I was on my own. I want to quit. The main reason is my mental health. I am not okay. I am in tears every night from frustration, wake up in the middle of the night with panic attacks and troubled breathing, and have constant headaches and migranes from stress. Would I be justified in leaving after the first semester? I don’t want to be seen as a quitter by future employers, and I would miss a lot of my students. However, when I think of working ANYWHERE else, even as a starbucks barista I think of one word: freedom. Freedom to take my life back. My family is on the fence about my decision. I’ve already seen that it is not going to improve. I cry when I think of staying here the whole year, let alone the semester. If you do hope to stay with this profession, I think it is best to try to stick it out and just try and survive until the end of the year. Lower your expectations. As far as dealing with all the stress, perhaps a therapist could help give you the tools for ways to coup. Marisa, your letter makes me angry for you. Private schools are not always the best places for teachers or students! If you were in a public school, you would be given resources to help you. First year teachers in our state are given, by law, mentors in the school so that they can get the help they need. In addition, they are observed- not evaluated- with the focus on providing constructive feedback. You are obviously not in a nurturing environment. What a shame; it sounds as if the school might lose a very good, conscientious teacher. I am so sorry for you. If you do leave, maybe you could voice your concerns to a school board. Or maybe try that before you decide to leave; what could it hurt? Again, my condolences. What are the consequences of resigning during the school year? Do you have to give a 2 week notice? What do you say on your next interview to any job opportunity about resigning? What do you write on a cover letter to get a less paying job even when you might be over qualified for that job? I am in a similar situation, panic attacks, depression, no time for my family, not sleeping or eating even on the weekends. Have no ambition to even attempt new ideas to make the situation better, it’s like I’ve lost all hope. I’ve been teaching for ten years and do not have another twenty left in me. The answers to those questions will depend on where you teach–it’s different for every state and district. I’d recommend checking with your teacher’s union for advice. Hopefully they’ll be able to offer you specific advice for your situation that’s beyond what I’ve shared in the post. All the best to you! I quit after the first semester of my first year. It was a terrible situation and I had no support. The principal told me that he would ruin my career. This meant he would cause me to lose my certification. I hired a lawyer who sent a letter to the county. The letter explained the situation and why I quit. They left me alone. I have taught off and on since then. I think teaching is like no other. In the best situation it is extremely draining. My family just moved to a new town and I started teaching in a small, new private school. I’m teaching 3rd and 5th graders in the same class. Most days I only get 30 minutes for lunch. I spend that time trying to do some planning and grading. I’m actively looking for something else in another field. This is just not what I want to do any more and I don’t feel bad about that. I have read and reread this blog. Thank you so much for your encouraging words. After many tears, conversations, and therapy appointments, I’ve decided to put myself first and will be leaving my current teaching position over Christmas break after nine years in the field. I love to teach (and will go back in the classroom someday) but the environment of this new school is not teaching……..it’s managing kids. There is little joy in learning for myself and my students in that type of environment. I keep reassuring myself there may be someone out there who better suited or skilled to work in this environment and meet the needs of this students. I needed to read that. I decided a week ago this was my last year. I’ve had 35 years in the classroom. Financially, on the outside, probably not a good choice, but it is getting to hard for me. I’ve worked very, very hard all my years of teaching, but I feel like the energizer bunny’s battery just stopped! I’m excited to do something different, but you are right, there’s always the feeling of, “Why can’t I keep doing this?” But, I can’t. I even thought maybe just 3-5 more years, but I need to move on. It’s time! Thanks. Thank you for sharing your story. As a first year teacher in an charter school with no windows, I can definitely relate to your experience. My three months experience at the school has left me thinking everyday to quit. However, I’m trying my best to stay until the end of the school year. I hope the next school that I do work in revamp my love for teaching. What if I’m thinking these things in the middle of my first year? Everyone says you’ll get into a groove by January, but I’m still as lost as I was the first day. I was given no curriculum and told to teach whatever I want as long as I hit 9th grade English standards. My mentor is also an Intervention Teacher who is in my room half of the day. I was excited about this because she could give me real feedback over an extended period of time. This has not happened; she only sends me feedback when she thinks something major has gone wrong. I tried to make a year long plan but that fell apart in the second nine weeks so I’m now just choosing a new topic every couple of weeks and trying to cobble something together. I’m in the building from 5:30-4:30 every day, if not later, and I feel like I’m making no progress. I can’t even say with certainty that I’ve taught my students anything this year. I have 170 kids and as an introvert it is exhausting for me to be in front of them all day and it feels nearly impossible to notice specific learning strengths and weaknesses in each of them. “Fake it ’til you make it” is just not working and I don’t know what else to do. LReynolds, I am so sorry to hear how hard things are for you right now! I know you’re an introvert, but I would strongly encourage you to tell ALL of this to your Mentor Teacher, ask her to sit with you and help you re-evaluate the year plan you tried to make. If she doesn’t have experience or inclination to try to give you specific help you feel you need and can use, then ask her to help you find someone who can Mentor you in your Subject area or who has experience making a year plan for English (maybe another veteran teacher in your department at your school, OR a teacher at another school in district who has experience with 9th grade English). If your Mentor will not help you herself, or help to hook you up with someone else who can give you specific help, then please do speak to whoever is in charge of your district’s mentorship program, or etc. It is COMPLETELY unrealistic and inappropriate of them to give you NO curricula and a Mentor who is not actually TRAINING you and MODELING techniques for you! I am very angry on your behalf! Also do tell your Mentor, or anyone you think is caring enough to listen, that you are seriously discouraged, overwhelmed, overworked, and wanting to quit for the sake of your health! AND STOP WORKING SO MANY HOURS, PLEASE! I speak from experience, you WILL wreck your health, but before that even you’ll have done severe damage to YOUR self-esteem, your relationships, everything else in your life that you value. Teaching is eating you up – don’t allow it! Work your 8 hours, and then GO HOME & DO SOMETHING THAT YOU LIKE TO DO, something that brings you love or joy or fun or peace or etc. (not binge watching Netflix, or etc.). Have 1 day a week where the kids just read & take notes, or work on their writing, for the whole period; this would be the time that you are grading papers, or writing lesson plans, or documenting communications. Scale back 90% of the expectations placed on you externally, then do likewise with the expectations YOU put on yourself. Then, & ONLY then, re-evaluate the expectations that are left: developmentally appropriate grade level standards/ DOK levels, etc./ the amount of time you’ve already spent on each standard/ the places you will want to spend some more time, and the amount of time you actually have remaining with students. You will see you’ve already done a lot with them; if you can get someone to help you plan the next 2 quarters, that will leave extra time to adjust along the way, so that you end up in June maybe having covered the things you think are important, and letting go of what you can’t control otherwise. You are only ONE person, this is NOT all on you! We strive to teach in a culture that does NOT value teaching or children (otherwise education would’ve been adequately funded, instead of just limping along in misery)! Sadly many schools would crucify you if you had a 90 minute busy work session. I think it’s a great idea..but if you get a surprise evaluation ……you are now an unsatisfied teacher …it’s ridiculous. ..and like I said before some ,enter teachers are tattle tales …..
Wow.I am pretty sad about teaching in the USA. I feel for all the families that still have children attending schools. Yeah…is getting harder and harder working with kids. I love them.I love all the kids and I love Education. I like planning my lessons and looking for resources to translate everything to “kids language” BUT…..between excellent kids there are kids that are bringing disrespect in and even bullying .They are bringing bad behavior to school and …make teachers jobs more difficult than ever ! Many parents do not realizing what is going on but sending their kids to school is not being good anymore….. I am completely worn out. I cry everyday. I don’t want to go back. The students are so disrespectful and don’t seem to care about obtaining an education. It’s my third year( after staying home to raise my kids) in urban public school. Thank God the staff is great. We all agree the school is toxic and wearing us all down. Our principal quit and our new one is trying to turn the ship around. Everyday I feel like a failure. Everyday I try to think of a way out. But I keep going. It’s good to hear that I am not alone. I just resigned after 8 years of teaching; 6 years in general ed and 2 years in special ed. I hate to admit that unlike the majority of you, I feel absolutely no guilt for resigning. I, like all of you, gave my absolute ALL into teaching these past 8 years. Up at 5am and on the job at 6—school began at 7:30. This last year I taught CBI-the students with the most severe disabilities. I changed diapers, did feedings, became nurse, mom, counselor, physical therapist, and speech therapist all while teaching on a district lesson plan for students in CBI. I DO NOT regret my decision, nor do I feel guilty for not returning this upcoming school year. I paid my dues—many days I went without a lunch period, a conference period, and no sub when my aide was out. I wonder if this would help you make your decision? Thinking about quitting went on leave now I feel like persona non grata; can’t find a position anywhere. I have data to prove my students excel but to no avail. I’m in NYC and eager to move on. I resigned this morning. I came home and googled “Why I quit teaching”…yeah, it all makes sense. Thank you for writing this! I live in Canada so our teaching system is a bit different than that of the U.S, but I struggle with the demands of teaching and deep down I know that it is not the right career for me. I love so many parts of the teaching profession, but over the last 10 years it has taken so much out of me and I have had this gut feeling that I am not where I should be. I have been wrestling with the decision to quit teaching, but like you said I always feel like I am giving up on the kids and I don’t want to seem like a failure. Lately I have thought about pursuing a different career path, one that I know will make me happy. After reading your message I am certain that I have the strength and family support to quit teaching and move forward in my journey. I decided to early retire this past year. Teaching has become something different than what I signed up for! This has been an awesome journey. I decided to start my own tutoring business and am actually back to teaching. I have 19 students and am loving every minute! I have returned to the fulfilling career that I originally began. I gave my notice that I was leaving at the end of the school year. It was a tough decision but I had no choice as the new principal’s demands were that of a business plan and not that of an educator. I’m staying to the end of the school only because of my kindergarten students and I have bonded. It’s such a toxic environment for teachers and students at many schools throughout the US. I’m not sure what is next for me but reading your article did give me a bit more focus and energy to move forward. Let’s hope the people of this country realize that the future of our educational system is grim and they start to move forward to support education and the teachers rather than spit on both. Thank you for writing this. I’ve been reading your blog for the past couple of years to try to find that balance. It just hasn’t come yet. Your story really hit home. I am also a sixth year teacher and all of my experience is in urban schools. I pour my heart, soul, and mind into my kids every day. I feel that I have finally reached my breaking point. I think I have to quit. It’s two days before winter break and I can’t even go in for my last two days. I know that I will find something that is more sustainable in education, but I do know that I can not give my kids what they need right now. I also know that I am so stressed that I can’t give myself what I need to make it day to day. Teaching is so hard and kids need so much, I wish we could all be the miracle workers that we believe we can be. I needed to read this post today. I took a job teaching 4th grade, and I am miserable. I want to transition and have a possible option but it might not come available until after Christmas break. I would like to hear others thoughts on quitting after the break. The opportunity would be a significant increase in salary. Thank you for writing this! I am quitting my job this year (aka not resigning my contract) and it is taking everything in me to continue carrying on every day. I also dream of getting hired at a school (hopefully soon) where my love of teaching will return and I will actually be valued and respected. I hope it’s out there. Thank you all for sharing your experiences. It has helped me to reach a decision. I’m only a student teacher, in my second year at university, and I already know this isn’t the career for me. I love the kids, but I’m not prepared to give over my life to a job. Especially if it doesn’t even pay well or earn the respect and appreciation it should do. The main reason I want to quit is that I always feel that I’m not good enough. That I’m a failure. A complete failure. Thanks for reminding me that quitting is not failure, and that failure would be not quitting. It’s weird to say I’m glad you left teaching, but I definitely am. Between your book, “The Cornerstone,” which I reference continually, and your blog, you have helped me in so many ways. Thank you! I wish I had seen this last week, but too late…I’ve already made the choice to leave my district of fifteen years and transition to another one. I hope it was the right decision. Thanks for your words of wisdom! Third day in a new school, in a new town, going into my 27th year of teaching Language Arts to middle schoolers and I am ready to quit/retire early. Why am I scared to tell my principal? I don’t want to disappoint this person that had faith in me. I just have to tell him…soon. Should I wait a few weeks to see if it will get better or go ahead before the kids get used to me? I’m ready to quit but do not know where to go and what to do for work. I teach high school history and have for 4 years in an alternative setting, but have been in and around education in some capacity for 20+ years. When asked what I want to do I can’t answer. I just want to work, not be stressed, and to leave my work at work. Working in a school with no curriculum, books, or real support has taken a toll on my health and my home life. I’m stressed all the time and am home sick and dreading going back. The job market is difficult in the Chicagoland area and not knowing what I can do is only making me sink deeper in fear and anxiety. HELP! go on INDEED. you can sub or just take a break for a few months if you can afford the no pay. you have to be sane and healthy, not for the students but for yourself. I too am in Chicago and been doing this for almost 30 years and soooooooo very tired of it too. life is short girl…you gotta do you!!! Wow! The comments to this are just amazing. I’m in a tough situation. I’m a special ed teacher, and I love teaching and I love my job. I’ve had a few extremely challenging students who have needed more restrictive placement. We’re meeting to discuss that with parents in a few days for one of them. My current frustration is that Administration, and even another special ed person, seems to feel like the students lack of success is my failure. I have done everything possible, including spending half my day with the student because we can’t find adequate para support. I understand what others see from the outside, a student who’s having difficulties with behavior, and that my other students don’t have adequate support. I’m in a no-win situation. I have always felt supported at work, but now feel like as we’re at the point of discussing how this placement doesn’t correct, everyone is drawing the wagons, and I’m no longer included. Not to mention the fact that I’ve asked for more support over and over again. It seems like I’m just blamed for not being able to do everything myself. I think the year will get better, and I’m going to hang in there, but the lack of support is really telling. People need to wake up to the real world, and that is that there are students who are very needy, and there will always be students who are very needy. I hope to find an administrator in the future who understands some of the difficulties. How did you quit without losing your license? In Georgia, the professional standards commission will take a teacher’s license if they leave without fulfilling a contract. And even if not for that, you get blacklisted. How did you navigate that so that you could just take a position at another district so fast? YIKES…really? In the midwest you can quit and still have your license…..thats crazy you will lose your license for maintaining your sanity. I have worked at charter schools and for the board and quit twice. the first time, i just told the truth and left; took a 10 month break; went to a charter school and thats that. I truly am tired of the profession. I am a math teacher faced with a new principal overly concerned about state tested subjects who speaks down to students who have learning disabilities who did not grow from the 1st benchmark. I am exhausted and stressed. I have already decided to not renew my contract. I feel like quitting right now due to fatigue and stress. I pray every Sunday night for strength to go to work on Monday.